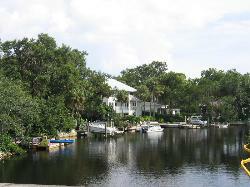 New Port Richey is bordered by cattle and horse ranches to the east and Gulf waters to the west. A scenic boat ride through the foliage and wildlife of the Cotee river brings you through the city of New Port Richey and out to the glistening Gulf waters, perfect for snorkeling, scuba diving, boating and fishing. The Cotee River, once a retreat for silent film-era movie stars, offers exciting tours through its enchanting jungle areas, replete with alligators and parakeets. West Pasco county has a number of well-kept recreational areas that provide entertainment for all ages, including ballfields, playgrounds, jogging, cycling and swimming. There are a number of festivals in the New Port Richey area that offer a healthy mixture of entertainment and cultural history. New Port Richey and Port Richey are West Pasco County's dual coastal cities, most well known as popular retirement communities. Both are located on the sun-drenched Central Gulf Coast of Florida, often called the "Gateway to Tropical Florida." New Port Richey has direct access to the Gulf of Mexico through the Cotee River where you can rent a sport fishing charter or explore jungle areas complete with alligators. Both Port Richey and New Port Richey offer recreational pursuits for every age and activity level. The Gulf's beautiful blue-green waters offer swimming, sailing, jet skiing, scuba diving and snorkeling. Several waterways found in West Pasco County are ideal for boating, canoeing, kayaking and fishing. And if golf is your game, there are a number of public, private and semi-private courses, many of them PGA caliber. Sims Park in New Port Richey has a very nice playground, walkways along the river, pavilions and an outdoor stage. While the Starkey Wilderness Park is a good place to view several different ecosystems. New Port Richey is less than a two hour drive to Walt Disney World, Epcot, Sea World and Universal Studios. New Port Richey is a prospering business community complemented by the area's natural beauty, culture, and bountiful activities. You want Florida, you want it all, and you only want to unpack once. No problem. You want Tampa Bay. Here, a single day's itinerary might include breakfast at a waterside cafe, Busch Gardens, The Florida Aquarium, a streetcar ride to Tampa Channelside for shopping, and a Tampa Bay Buccaneers, Devil Rays, or Lightning game. Then on to historic Ybor City where the Cuban sandwiches are hot and crisp, the cigars are hand-rolled, and the colorful streets are lined with fun. Visit us, Vera Basler, Eberhard Basler, Eric Basler and Adrian Basler in New Port Richey, Pasco County, Florida. For a quick impression choose the sitemap.